With its banking and financial infrastructure still in tatters, a new mobile service that allows Haitians to make and receive payments via text message is taking off and allowing commerce to flourish. Last year, Haiti suffered a catastrophic earthquake that caused widespread devastation–a tragedy that puts yesterday’s quake, which sent shockwaves of worry up and down the East Coast despite little damage, into stark perspective. The impoverished country is still recovering–but slowly, as several reports have indicated. But there are glimmers of hope in Haiti’s rise from the rubble: Technology is playing a prominent role in the country’s recovery, especially in rebuilding Haiti’s ravaged economy and financial infrastructure–more than a third of Haiti’s brank branches, ATMs, and money transfer stations were destroyed in the earthquake, leaving millions without access to money. 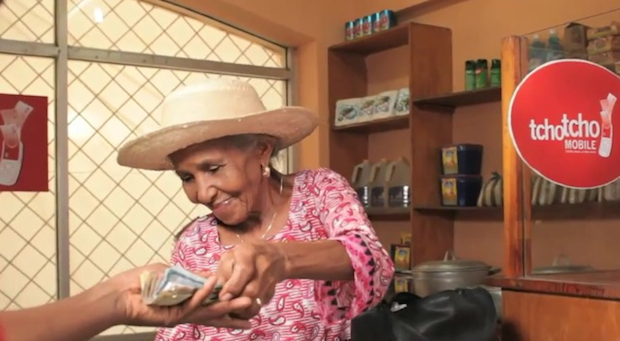 (Though, even before the quake, fewer than 10% of Haitians had ever used a traditional bank.) But that’s changing, thanks to mobile wallet technology. one’s own cash. “It cuts out the risk factor,” he says. TchoTcho requires nothing more than an SMS-capable cell phone–a viable solution to Haiti’s problems given that an estimated 85% of Haitian households have cell phones. To sign up, one can easily dial a code to access a digital wallet managed by a local TchoTcho agent (there are currently 517 agents across the country, at various outlets like corner stores). Essentially, the mobile wallets act as digital bank accounts, enabling Haitians to make deposits, transfer funds, pay bills, and receive government aid or NGO grants, all via text message. Forget NFC technology, iPhone apps, or flashy gadgetry like Square–TchoTcho works on any mobile phone (smart or otherwise) and with account balances of up to $250. The results thus far have been astounding. After launching in April, TchoTcho grew to 20,000 users by June. By July, that number had more than doubled to 50,000 users, and in the last few weeks, the service rocketed to 110,000 mobile wallet carriers. Even more remarkable is the usage of TchoTcho. In June, there were just 54,000 recorded transactions. In the first 17 days of August? More than 925,000 transactions.